Preface: I have spoken to Peter for many years via telephone whilst working for Dawkes. Throughout that time he has regaled me with his jazz related historical stories and teachings. In fact, in preparing to give jazz related talks in the North West he’s often sent me a copy of the talk with accompanying CD. I felt it was time for some of these fascinating stories to be re-told to our customers, for its on these building blocks that the current genre of jazz in the UK was born…Sam @ Dawkes. The writing was on the wall or, at least, it was in the The Musicians’ Journal, the journal of Britain’s Musicians’ Union. In July, 1929, ‘THE ALIEN IN OUR MIDST’ was the capitalised headline for an article in The MJ written by ‘A. BRITISHER’. In January, 1930, in the same journal, ‘The Alien Menace’ headlined a piece by W. Batten, Joint Secretary of the London Branch of the Musicians’ Union. ‘ABANDONING THE ALIEN’ was another capitalised headline for a leading article in The MJ in January, 1931. Headlines like these may bring to mind the anti-Semitic propaganda of the Nazis or, regrettably, vitriolic canvassers nearer to home. But the objects of The MJ’s anger, the aliens in question, could not be identified by race, colour or creed or because they were seeking asylum. These aliens would include some of the greatest musicians and orchestras the world has ever known. In simple terms, they were foreign musicians. Apparently these aliens, and this has a familiar ring, were stealing ‘our’ jobs or, as ‘A. BRITISHER’ put it, employment for the British musician was ‘being snatched from him by the aliens’. This opposition to foreign musicians was also acquiring political muscle with those from across the Atlantic coming in for particular attention. At a meeting at the Ministry of Labour in 1930, involving a deputation from the Musicians’ Union, ‘it was agreed there was little necessity for importing complete American bands’(MJ, January, 1931). So, we might get to hear Fletcher Henderson, but without Rex Stewart, J. C. Higginbotham, Buster Bailey and Coleman Hawkins, or Ellington without Hodges, Carney, Bigard, Cootie and ‘Tricky Sam’. British jazz fans must already have feared the worst. And worse was to come. This deterioration, it has been argued, was sparked off, or maybe it should be stomped off, by a visit to Britain by Duke Ellington and His Famous Orchestra, a tour that began in June, 1933. To the Musicians’ Union, already fearful that American musicians were taking work away from its own members, the Duke’s men committed a cardinal sin; they were immensely popular. So much so, that extra concerts had to be hurriedly arranged to meet public demand. The Musicians’ Union strengthened its resolve to ‘protect’ its members’ jobs. 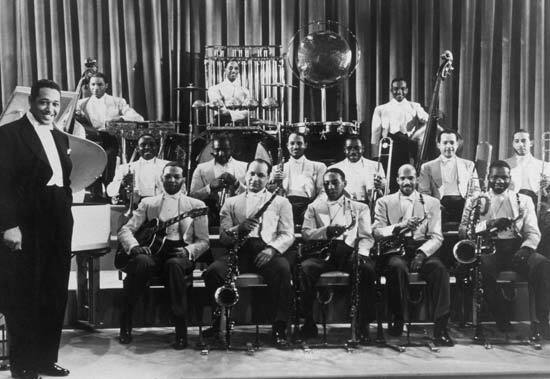 Duke Ellington and His Orchestra did not play in the United Kingdom for the next twenty-five years. Apart from those allowed to sneak under the radar during the War, American bands were kept away from our shores until 1956. Soloists and small groups were also affected and few musicians had more interesting ways of testing what became known as ‘The Ban’ than Coleman Hawkins. In 1934 he had been invited to England by Jack Hylton and had appeared as a star soloist around the UK, but in 1938 he was on the Continent and was desperate to get to England to tidy up some loose ends before returning to America. Approval from the Musicians’ Union and permission from the Ministry of Labour to play in front of paying British audiences were now out of the question. Then, in February, 1939, a headline in The Melody Maker read: ‘”Hawk” Back To England On Queerest Job Ever’. Hawkins was going to tour on behalf of Selmer Ltd., giving promotional and educational recitals for free with tickets being available from local Selmer stockists. The Selmer tour ended in April and Hawkins would soon return to the States. By 1949 Hawkins was again touring the Continent, where nothing like the British ban operated. On 11th January, 1949, despite lacking permission from the Ministry of Labour, Hawkins flew to London and played for no fee and to great acclaim to a packed house at London’s Princes Theatre. Hawkins and his rhythm section were soon safely back across the Channel, but ‘justice’ had to be done. One of the organisers of the event, Bert Wilcox, subsequently received a summons alleging that he ‘did unlawfully aid and abet one Coleman Hawkins in contravening Article 1 (4) of the Aliens Order, 1920’ (MM , 20th May, 1950). Bert Wilcox was later tried at Bow Street Magistrates Curt found guilty and fined £75. On 26th January, 1951, in the Kings Bench Divisional Court his appeal against the original conviction was unsuccessful. As for Hawkins, he next came to this country as part of Jazz Parade, which toured Europe in the autumn of 1954 and featured Illinois Jacquet and Sarah Vaughan. Again, so far as I am aware, the Hawk didn’t have permission from the Ministry of Labour or the approval of the Musicians’ Union. However, while in the UK, Jazz Parade only appeared (on foreign soil?) at American Forces bases, and, so, didn’t run foul of the 1920 Aliens Order. Presumably the Hawk wasn’t an alien in Lakenheath. It would be another four years before Hawkins returned to play. In 1958, for the first time in over twenty years, Hawkins played in non-promotional, open-to-the-public, professional concerts in this country, when he was part of Norman Granz’s Jazz at the Philharmonic tour. No doubt it will be argued that the picture I have painted is very one-sided and that the union representatives for American musicians were very protectionist and obstructive as well, though a pertinent question is: was there a demand for British music in America? There was certainly a great demand for American jazz in Europe, particularly after the Second World War. Another question that deserves consideration is: who suffered because of ‘The Ban’? British jazz fans suffered and British jazz musicians suffered, not least those who played in rhythm sections, where stodginess became the default style. Stopping poets at the borders was part of a censorship scheme proposed by Plato. Whatever his motives, I am sure his scheme would have done nothing but harm to poetry. Likewise, ‘The Ban’ was surely a massive impairment to British jazz. Against this it might be argued that British jobs were saved. But suppose Goodman’s sextet had played at the Palladium, that some of the American stars from the Paris International Jazz Festival of 1949 had been welcomed here and that after Lakenheath, Jazz Parade had played at Birmingham Town Hall. 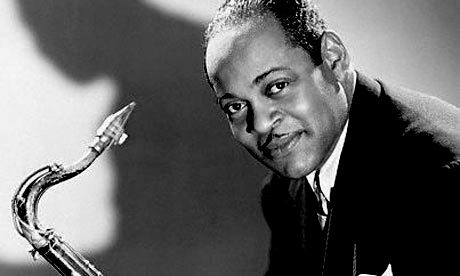 Suppose that tours of Europe by Louis Armstrong and the All Stars in 1949 and 1952, by Jazz at the Philharmonic in, say, 1952 and1954 and by Count Basie in the early 1950s had all had some British dates. What British jobs would have been ‘snatched’ away or lost? It wasn’t as if there were British jobs being snaffled up by these visiting Americans or that they were elbowing out local talent or undercutting British musicians and driving wages down. In fact, when the American stars did begin to appear over here, there were lots of British musicians who weren’t working; they were in the audience listening, applauding and learning. Interestingly, when jazz became increasingly popular in this country in the 1950s, the jazz in question was played by legions of the young and eager trying to emulate earlier styles from New Orleans and Chicago. It was this young musicians’ Trad that attracted such a substantial following. Trad was heard in pubs, clubs, students’ unions and church halls and on marches, steamers, floats and even trains, and, in the main, it was played by non-unionised labour. Acknowledgements: I am grateful for discussions on ‘The Ban’ with Joshua Sternfeld and for his informative dissertation ‘No American Bands Need Apply’ (2000). I am also very grateful for the help and diligence of David Nathan, Secretary of the National Jazz Archive, Loughton, Essex. The mistakes are all mine.